Last Sunday our week started off with a 13 hour drive from Fresno, CA to Twin Falls, ID. An incredibly long drive, and the longest I have ever taken with Riley. She was a trooper and was a great little girl the entire drive. With frequent stops to potty and stretch our legs along the way. 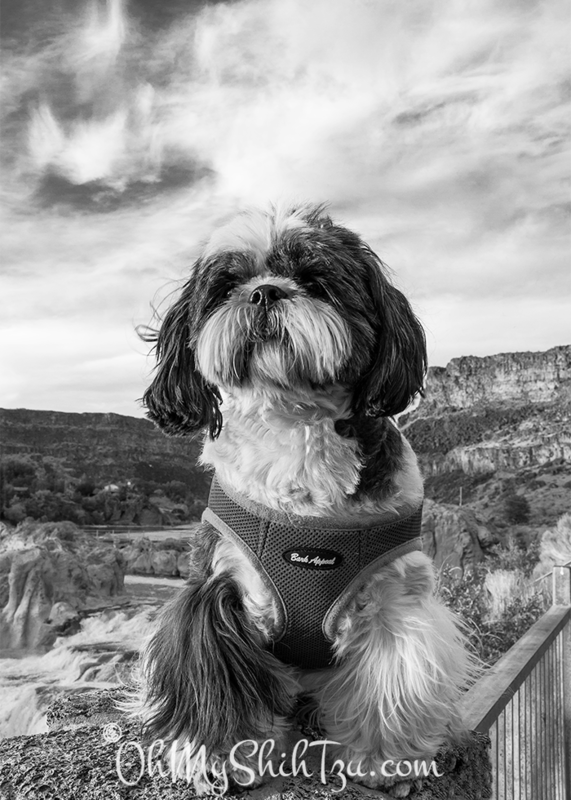 Today I am sharing a picture of Riley looking over Shoshone Falls in Twin Falls. Be sure to join us on Tuesday for a special installment of Tzu Travelers as we visit the wonderful little town of Twin Falls, ID. We are so happy to be joining Black & White Sunday with hosts Sugar the Golden Retriever and Dachshund Nola. Be sure to visit our hosts and all the other incredible bloggers for Black & White Sunday! what a fantastic trip and photo! Such a great shot. We are going to be up the road from you in Sun Valley this weekend. We will be in Ketchum doing an art show. What an awesome photo! He looks so huge and the falls so small. Love it! Emma recently posted…Whodunit? Detective Emma is on the Case! WOW! So dramatic, what a stunning photo. Great choice for B&W! Love the picture! Riley is looking very regal! Dogs N Pawz recently posted…Black and White Sunday: Doggie BFF’s! Beautiful picture! I would love to get a chance to see that scenery. That is a great photo! What wonderful scenery. What a beautiful photo!! Riley is posing so perfectly! What a cool photo – Looks like such a pretty area! Kevin recently posted…Black and White Sunday: Road Trip!